We strongly believe travel is the best thing you can do with your time on this strange old place we call Earth. But we don’t think it should cost the Earth to do it. That’s why we’re sharing our best and brightest ideas about how to save big on flights. So, yeah, just turning up at the airport isn’t such a great idea anymore. The good news is, we’ve invented a few cool tools in our free app that can help. These prices were valid as of April 17, 2019, and may not always be available. Bookmark this page – we’ll be updating it daily! Need to travel the same day? We’ve got you covered there, too. Just tap ‘Filter’ at the top right of your screen. If you then hit ‘Times’, you’ll see the cheapest times of day to depart and return. In more good news, if you’re really flexible, you can search ‘cheapest month’, and see which time of year is cheapest for travelling to your destination. You can do this on our website, and in the app’s ‘Calendar’ and ‘Chart’ views. Flight prices are funny things. They can fluctuate madly — choose to buy a flight to New York one minute, and it might cost less than a sweet pair of sneakers. Hold off booking for an hour, and the new price could put a dent in your pension. So, how do you find the right price when it feels like you’re playing a random game of flight fare roulette? We’ve got a few tricks. 1.) Signing up for different airlines’ newsletters is a good idea — they’ll let you know about last-minute flight sales, which often happen when the airline needs to fill up a route. 2.) At Skyscanner, we analyze thousands of flight routes, combinations and prices. We send out the best deals we find each week to our newsletter subscribers, so you might want to sign up for our newsletter, too. (It’s free, so there’s no catch. 3.) We also publish a round-up of flight deals under $100 every week. So if you’re the spontaneous type, you might like to bookmark the page and check back every Monday. 4.) You can also ask us to watch fare prices for your favorite route. If you’ve got your eye on a particular destination or flight, set a Price Alert and we’ll email or text you when the price drops or rises. Sound good? We’ve got a quick guide to setting price alerts below. And, yes, our alerts are free, too. You can set up a Price Alert on our website (so we’ll email you) or through our app (so we’ll text you). Either way is super-simple, and will help you find the sweet spot for your flight. On the website: First, head over to our homepage and search for the flight you’re interested in. (Where from, to, and which dates.) In the top left of the results page, you’ll see a button with a bell on it, which says ‘Get Price Alerts’. Hit this and — hey presto — you’re done. We’ll email you with any updates about price changes. In the app: Got our app? Great. Open it up and tap the plane icon to search for the flight you want. See the results? You’ll also see a round, grey button with a bell icon at the bottom left of your screen. Give it a tap. Et voilà, we’ll text when the price changes. You can also turn off your Price Alert anytime you like. Obviously, the more flexible you are, the more likely you’ll bag a big deal. But that doesn’t need to mean staggering bleary-eyed to catch a 3am flight no one else wants. In our experience, the more spontaneous you are, the better chance you have of bagging an awesome holiday that won’t bust the budget. And you get to tell the story, too. “I woke up in my apartment on Monday morning and was sipping a rum punch in Guadeloupe by the evening — and it only cost me $200” definitely sounds cool. Some package vacation companies sell off last-minute trips at huge discounts when their customers cancel. (The same is true for hotel rooms). It’s worth calling and asking if they have any same day deals. Try using our ‘Everywhere’ destination option when searching on Skyscanner. We’ll show you the cheapest flights we can find from your preferred airport, on your specified dates, to places all over the world. You could end up literally anywhere! You can also throw the metaphorical ‘Everywhere’ dart at the world map using our app. Open up the app and click ‘Flights’. Add in your origin airport and the dates you want to travel. Then, type ‘Everywhere’ into the destination box. Next, click the blue ‘Start Exploring’ button to see where you can go for the cheapest price. You can change your dates simply by clicking on them, or select the whole month if you’re really flexible. Another way to do it is by clicking the ‘Explore’ button at the bottom of the screen. We’ll recommend top deals to places all over the world, show you popular destinations, and suggest the best weekend deals for a last-minute getaway. *These prices were valid as of January 31, 2019, and may not always be available. Bookmark this page – we’ll be updating it weekly! You can increase your chances of a cheap last-minute fare by looking at the most popular tourist resorts and cities. These destinations will have a larger number of scheduled flights, leaving from more airports — so you’ve got a better shot at finding a deal. Plus, lots of major airlines will be flying these routes, so you can expect competitive prices. Make the trip even cheaper by going all-inclusive. This is a solid last-minute option because all-inclusive holidays don’t require any advance planning — everything is included. Better still, we got our experts to put together a guide to the best all-inclusive resorts in the world. Popular resorts and cities have loads going on, so it shouldn’t be hard to book activities and entertainment at the last minute, either. We can also help you search for deals on major sights and attractions. Fortune favors the brave, they say. Well, we say it depends on just how brave you want to be. Truth is, waiting to book until the week you want to travel can be tricky if you’re not flexible. 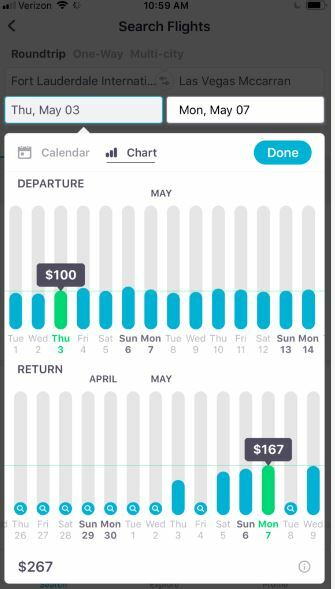 Flight prices often increase when you try booking at short notice, probably because airlines assume you really need to get there — whatever the cost. But if you’re daring enough to play flight-fare chicken — waiting until the very last second before making a move — it could pay off. Flight prices can drop as the departure date draws palm-sweatily closer. If you want to travel on Friday, but can’t find the right fare on Tuesday, don’t give up just yet — try Wednesday, Thursday and the big day itself before you throw in the towel. If you’re searching with us, we’ll always show you the very best value fares at that time. In a matter of seconds, we can compare thousands of flight deals so you don’t need to do weeks of research. Take a peek at our cheat sheet right here. We should say, of course, that this isn’t an exact science — which is why Price Alerts, signing up for newsletters, checking out the ‘cheapest month’ tool and being super-flexible are all good ideas, too. In any case, hopefully we’ve helped you get excited about your next trip.